The following is a collection of contributions from members of the Ex-Christian Science Group dealing with paranoia about Catholicism. 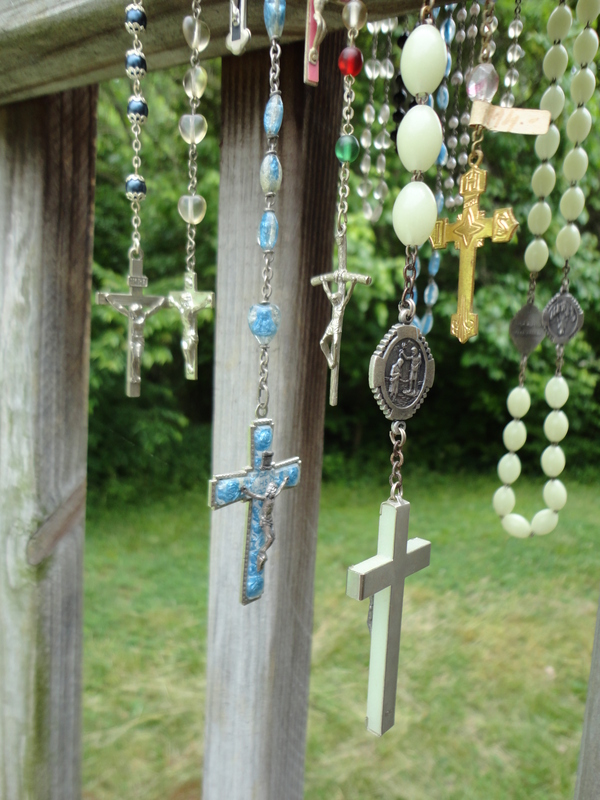 A collection of rosaries, photo courtesy of Katie J. My family had creepy stuff: manuals carefully transcribed on onion-skin, with articles by Bicknell Young and other sources. They describe Jesuits secretly devoting their lives to the destruction of Christian Science, and ‘mental malpractice’ in general. They warn against even being near a Catholic, since they are ‘unwitting transmitters of animal magnetism’. It was paranoid! Funny how it wasn’t even theologically consistent— wasn’t everything supposed to be good in Christian Science? I used to have a Catholic friend who accused us of ‘worshipping’ Mary Baker Eddy, and I was so offended. Now I realize he was right. I am curious if this aspect of my Christian Science upbringing was unique, or was it also experienced by others: that is, the way I was taught to view the Catholic church as something very dark, evil, and negative, to be avoided at all costs. I was taught that ‘the other churches, they are just ignorant—but the Catholic church, they are the ones actively using Error to try to bring down Christian Science.’ I was told that Catholic leaders pray for the downfall of Christian Science and even that they pray ‘the anti- Scientific Statement of Being,’ i.e., that they pray “There IS life, truth, intelligence and substance in matter…” etc., and I was taught that it’s one of the things a Christian Scientist should pray about every day, that ‘there is no power in the Catholic church.’ I was taught that the ‘spiritual wickedness in high places’ passage in the Bible was a reference to the Catholic Pope. I was taught that no Christian Scientist should ever have a close personal friendship with any Catholic, because Error could use that relationship as a way for the Catholic church to attack Christian Science. My grandmother learned this deep fear of Catholicism from her own Christian Science Teacher. As for the Christian Science antipathy toward Catholicism, I was quite unaware of it until, as the chairman—and, in our small church, the sole member—of the music committee, I hired a Catholic friend to be the soloist. It was common for the soloists hired to not be Christian Scientists. She did admirably at the first service and, as innocent as I, she revealed her Catholic faith while chatting with church members. Imagine my chagrin and deep embarrassment when I was required to tell her that she would not be allowed to sing at my church again. I was wondering: did anyone else have the experience of being lectured about the dangers of Catholics? That was another thing that was constantly drilled into me. I really believed that all Catholics were practicing malicious animal magnetism towards Christian Scientists and I should stay away from them. Ah!!! I love this site. So many things make sense!! I never knew why but my mom and grandma always acted like Catholics were insane and the churches were so creepy! I had no idea it was a CS thing and I never got it. Growing up in CA we learned a lot about missions and had to visit them and my mom would act like she was watching a horror movie just being in the mission. I never got it and always thought they were nice. I wasn’t forbidden from being around Catholics and went to a few Catholic wedding and funerals and kept wondering why the churches seemed to scare my mom so much. At the same time, my mom and grandma always seemed to be very fond of Mormons, maybe because they are also a misunderstood religion and abstain from alcohol and caffeine? Thank you for this. It helps so much to have this paranoia in the Christian Science church community unmasked and plainly stated. I am Catholic and I’ve studied Christian Science (because when nothing else was helping me, it literally saved my life), and I have occasionally/rarely attended CS church services. Often when I innocently mentioned that I was Catholic, I encountered very odd behavior, people literally rolling their eyes or wrinkling their noses or barring me from some activities, and saying very strange things or assuming very strange things. And some practitioners even voiced some of the above nonsense (as if anyone, Jesuits or others, in the Catholic Church even knows or cares enough about CS to pray against it…. so silly), as well as voiced other supposed but ridiculous and untrue things that “Catholics believe….” And if I tried to correct them, they assumed I was brainwashed and simply didn’t know about the supposed sinister activities of my church. Makes for some good creepy conspiracy drama though, eh? There is no evil…. except in the Catholic Church and Catholics. OoooOOOooooOOO…… nice and eerie…. but not true. We’re just people too, looking to understand God and life, and of course make some mistakes, but organized attacks on CS? No. But I had no idea the level of anti-Catholic nonsense that had been, is being, circulated in the CS community until I found this. I’d only encountered it in snippets and generally stayed away or kept aloof because of Christian Scientists’ odd reactions to me. Anyway, thank you for just bringing it out into the light so it can hopefully just begin to stop now and disappear. Class instruction 1986. The teacher read out to us a letter from the CS board of directors. The Catholic church is working systematically against CS. My Dad’s partner of 30 years is Catholic. I’ve seen by her example what goodness and Christian love and family love is, including nagging my Dad to get to a doctor or driving him to the ER. I don’t feel attracted to the Catholic church but a lot of Catholics I know are very fine, warm-hearted, genuine people. I was told by my CS mother that the Catholic Church was the false church spoken of in the book of Revelation. I had always had an interest in Catholicism since my life had been saved from Federales in Mexico by praying Catholics. I didn’t get to convert unti I was much older. She always believed that persecution would arise from the Catholic Church because they wanted to “stamp out” CS. She really believed that Christian Scientists were always in imminent danger of persecution arising and being killed for their beliefs. Wow – 2 things …. 1- I wonder if it was because Catholics have a Jesus on a Cross / Cricifix in their edifices? Like – Christian Scientists are all “holier than thou,” because they know Jesus rose up from the dead and then ascended!! And thus – since Catholics are apparently (from my Ex Christian Science perspective) stuck on the fact that Jesus was on a cross – maybe that’s just gross and disgusting. And that’s why Christian Science folks are scared (??) of Catholics? Why does any Christian Scientist believe what they do? Who knows. “A sin is forgiven only when it is healed” or something like that. 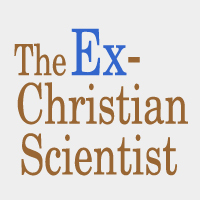 As a Catholic who studies Christian Science, I’d offer this: What you’ve said could be among the reasons that Christian Scientists look askance at Catholics and the Catholic Church…. And there are probably better ways to say this, but to my understanding the Catholic Church uses the crucifix as a symbol to say that Jesus did that much to show us spiritual reality, that without the cross there isn’t even any resurrection for us to contemplate and learn from. So that biggest act of his, accepting the crucifixion, is something to really think on, thus the image. But I could understand how that might be disgusting, scary, offensive or seem ridiculous to others. Growing up Catholic, you certainly do get used to the image. And confession can just be seen as a way to be able to talk to someone if we are feeling badly, and a priest is meant to reassure people that they are still loved in God’s eyes. That’s the main of it in my experience and in the best articulations that I find. But people are at all levels of understanding, and growing from there, sure. I do not understand your comments at all..very confusing as someone whos studied Christian Science for many years but also kept a hand in fundamental religion… My experience is that Catholics are never given any real in depth information or practical experience.. and going to a man in a box to say your sorry and be forgiven by another man is relative to thinking another person is to blame for your sins and is therefore in charge of your decisions.. so it only drags people away from talking to God..or their inner truth .. Life Love Healing is an ‘ Inside Job ‘ comment from a long time 12 step program aquaintance.. I recall the Priest sprinkling water on us and telling people if they are there because they have personal problems then they are at Church for the wrong reason.” Immaculate Conception B.C. As another Catholic who studies Christian Science as well as listens for Truth anywhere I’d say this: We all sometimes talk to a friend or seek reassurance and comfort from someone else. You can see Catholic confession as an offering to people not a punishment. You can speak confidentially and at no cost to someone who is meant to reassure you that you have not lost your value in God’s eyes even if you’ve made a mistake and feel bad about something. You are still loved and worthy and in God’s eyes have not become less than you are and will always remain. It isn’t a superstitious “magic wand” of authoritarian “forgiveness,” though some might see it that way as they grown in understanding. Catholics are all individuals, and Catholic clergy are all individuals, some more knowledgeable than others, some more skilled at spiritual counseling than others. Catholics are certainly given much in depth information and practical experience, and they too must look to the right sources and the most thoughtful articulations, and then think it out for themselves, but any individual will take that in at their own level of understanding and ability as well. We all encounter individuals who do not reflect the highest and best of whatever religion or tradition they are part of, but that is not a statement of all that is present therein. Sometimes it just takes some more searching, digging, listening, asking questions, and pondering. Catholic believes that the Priesthood started when Jeusus commissioned the Apostles to spread the Gospel. Just like there was a Priesthood through the tribe of the Levites in the Old Testament. Jesus gave the apostles the power to forgive sins. When we sin, we sin against God and no one else. I hope this helps you understand us better. I remember my mother telling me that the Pope at the time of Mrs. Eddy was “afraid” of CS and wanted Mrs. Eddy to stop preaching it, and that certain groups of nuns and monks had as their sole duty the obligation to pray specifically against CS. We were not allowed to have “RC” friends (our mother couldn’t even bring herself to say the word “Catholic”). The first question we were asked when we spoke of a new person we’d met was, “What church do they go to?” If the answer was “St. Paul,” we were told that that child’s parents and priest would pray against us generally and specifically. Any public figure who was Catholic was condemned out of hand. You can imagine the things said about JFK during the 1960 campaign. During Class Instruction we were told to pray daily against “isms” and “ologies.” In other words, any system that ended in those suffixes was “non-CS” and should be treated as spouting false teaching. So “Catholicism” was always the first “ism” to be sent to the lowest reaches of “CS Hell,” followed by Episcopalianism (just one slight remove from Catholicism), Adventism, Mormonism, and then of course the physical sciences like geology, minerology, meteorology (although I was intrigued by those subjects). I remember the specific day we were taught to pray against “isms” and “ologies” too! Crazy! MBEddy was so spooked by Spiritualism! For something that “isn’t real,” she sure made sure that everyone else prayed against it. What – so it – wouldn’t become real? Doesn’t something supposedly become real if you put your thought on it? The crazy making in Christian Science. Makes my head spin! I can’t believe I stayed in it for so long. It’s just mental gymnastics. Like keeping track of all the lies that have been spun, so you won’t get it wrong …. Crazy crazy crazy. I have heard this kind of superstitious thing as well… that certain groups of Catholics supposedly prayed or even still pray specifically against Christian Science, or I’ve heard various beliefs about a Pope’s view of CS as if his opinion was somehow more tainted or powerful than anyone else’s might be, however, I do not believe any of this kind of thing. When such things are said, I think there is the need for proof, for specific references, for direct examples, and I don’t think that such can or will be found (but even in far-fetched imagination if it somehow were, so what, that’s just a few people, thinking wrongly). As my Catholic daughter would say, “They give it more power than we do!” Whether that be the Pope’s opinions or ignorance about certain subjects, confession, sacraments, or what have you. I consider myself Catholic by choice and much deep research, thought, and inquiry and quite honestly such suggestions give me a giggle. As my daughter says, we sometimes barely know the people next to us in the pews, how, much less why, do CStists, or anyone, think there is such “organized” activity against them by Catholics of any rank or state of life? I know many nuns and monks quite well, and I would be sorely tempted to say that they have enough to think about without praying “against” anyone! I think we can begin to stop lumping people together in “ism” or “ologies,” stop fearing one another in general, and just ask questions in the right way to the right people, and then ask some more, learn about one another, and not demonize one another based on misunderstandings, hearsay, prejudice, stereotypes, or superstitions. I love the good in Christian Science as well, the good in Catholic understandings, the good…. anywhere….. but the CStists have certainly made it difficult to have free exchange when too many hold these superstitious fears about the Catholic Church and Catholics. Though in all fairness, any individual Catholic may also hold false understandings about Christian Science as well! Onward to greater understanding between all of us!